The Clive Davis Arts Center at Bedford Playhouse presents a very special evening with Kerry Kennedy on June 7th. Join us for a screening of the 1968 Academy Award-winning documentary, Robert Kennedy Remembered. An audience conversation and Q&A with Kerry will follow the film, including a personal introduction to her new book, Robert F. Kennedy, Ripples of Hope. Including interviews with international figures from Barack Obama to George Clooney, Gloria Steinem, and more, Ripples of Hope explores Kennedy’s influence on issues still at the heart of America’s identity today. 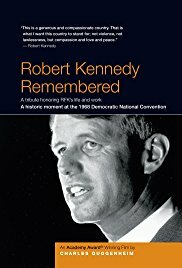 Shown on all television networks simultaneously in August of 1968, Robert Kennedy Remembered brought the Democratic National Convention proceedings to a standstill and the crowd, in tears, to its feet. The film was produced in only four weeks, two months after the Senator’s assassination, and went on to win the Academy Award® for Best Documentary Short in 1968. “To watch it is to experience a profound sense of loss and tragic waste all over again.”—Los Angeles Times. Seats are limited, tickets on sale May 21 — Save the Date!